Anyone that has handmade anything, will appreciate how hard it can be, to make a real neat job. 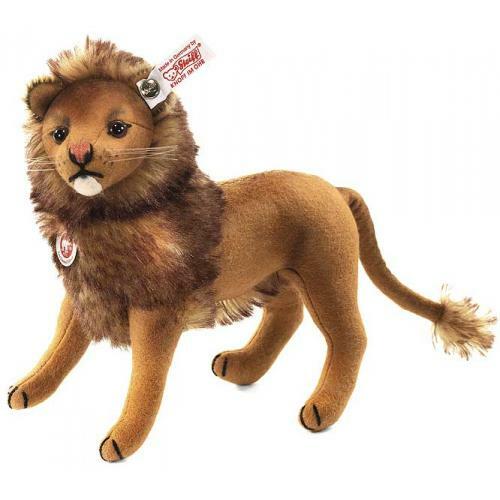 Working with wool felt can be harder especially for collectable items like Leo Lion by steiff. Only 1,500 pieces, worldwide have been made. He comes boxed with his numbered certificate and of course he wears his famous, Button in Ear which is gold plated on this limited edition. Leo is 21cm from end of body to tip of his nose, he has safety eyes and synthetic filling material. He also has a single jointed head, so you can pose him to look each way, wherever you place him. His nose and mouth are hand stitched with some airbrushing around various parts of his face and body and his beautiful Lions mane is made with golden brown tipped mohair.